Be the first to share your favorite memory, photo or story of Dr. G. Kenneth . This memorial page is dedicated for family, friends and future generations to celebrate the life of their loved one. The Rev. Dr. G. Kenneth Ross, pastor of Milner Baptist Church, went home to be with his Lord and Savior late Friday evening, October 19, 2018 from complications of heart disease at the age of 72. A native of Seminole County, he was born July 15, 1946, a son of the late Albert and Dorothy Ross. Dr. Ross was a long-time pastor of several churches in Georgia. He spent the last four years of ministry at Milner Baptist Church, having previously served there in the ‘70s. 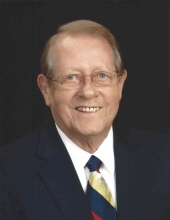 Of all the churches he served over 47 years of ministry, Milner was his most cherished. During his time of ministry, he served as President of the Georgia Baptist Pastors Conference, chairman of Board of Directors for The Christian Index, member of Board of Director at two Georgia colleges, as well as a member of various Georgia Baptist Convention committees. He spread the gospel and showed God’s love for nearly 5 decades. Dr. Ross enjoyed spending time with his family and closest friends. He loved the game of golf and preaching the Gospel of Christ. A beloved husband, father, grandfather, brother, cousin, uncle and friend to so many, he is survived by his wife of 55 years, Donna Peavy Ross; two daughters, Tina Ross Mann and husband Zack Holt of Newnan, GA, and Kelley Ross Jenkins and husband Rich Jenkins of Sharpsburg, GA; brother, Jerome Dennis Ross of Donalsonville, GA; grandchildren, Megan Ann Mann and husband Jeff McFarland of Jacksonville, FL, Hannah Madysen Van Dora and husband Tash Van Dora of Atlanta, GA, and Nichalas Ross Jenkins of Macon, GA; nieces, nephews, and cousins. Funeral services for Dr. G. Kenneth Ross will be conducted on Monday, October 29, 2018 at 12:00 noon at Milner Baptist Church, with Reverend Bobby Boswell officiating. Interment will follow at the Milner Cemetery. The immediate family will receive friends and family on Sunday, October 28, 2018 from 5:00 pm-7:00 pm at Carl J. Mowell & Son Funeral Home, Fayetteville, GA. In lieu of flowers, the family requests donations to Milner Baptist Church in honor of Dr. Ross’ passion for the gospel and love for the town of Milner. To send flowers or a remembrance gift to the family of Dr. G. Kenneth "Ken" Ross, please visit our Tribute Store. "Email Address" would like to share the life celebration of Dr. G. Kenneth "Ken" Ross. Click on the "link" to go to share a favorite memory or leave a condolence message for the family.